Who are we? We are software developers, social media consultants, bloggers, writers, engineers, project managers, and more. We are independents and freelancers. We are teleworkers. We are "creatives" and entrepreneurs. We could work anywhere, but we choose to work together in the building at 122 E Patrick St.
We are creative, driven, focused, and motivated by having others around us who share these qualities. We want to be part of something bigger than ourselves, to contribute, to be challenged, and to grow. We are social and like to connect, to network, and have fun. Alas! It's not all about socializing and having fun. In fact, it's not even mostly about that. We coworkers come together to work, to do our daily jobs. We prefer to do that work around others who are also working, rather than home alone or amidst the noise of a coffee shop or restaurant. We are "green" and care about the impact our daily actions have on others and the environment in which we live. We buy local as much as we can. Our building is a mid-1800’s row house, restored by local contractors using, in many cases, locally salvaged and repurposed materials. We're called Cowork Frederick for a reason. We love historic downtown and are actively involved in the broader Frederick community. We support local charities and businesses, participate in downtown Frederick events. The art on our walls is by local artists, with a new local artist featured each month. Cowork Frederick is a member of the Downtown Frederick Partnership and the Frederick Chamber of Commerce. The individual members of Cowork Frederick are members of many other local networking organizations, such as the Frederick Social Media Club, the Greater Frederick American Advertising Federation, Frederick Web Tech Group, BNI Frederick, Frederick Startup Community and more. and SO MUCH MORE. Stop by. We'd love to meet you and for you to get to know us better. Who we are is largely shaped by our community, our members. That said, we generally adhere to the values of the coworking movement. Collaboration Our space and activities are designed to encourage interaction between members with the goal of fostering collaboration and “organic” incubation of member businesses. Openness All people and ideas are welcome. Our members play an active role in shaping who and what we are. The exception? Coexistence does not include tolerating abuse, negativity, or offense. Our doors are wide open (Mon-Fri 9 am to 6 pm) to those who want to come in and work for a day (membership not required, but $25 Day Pass is). We are also open to hosting events, and often do. 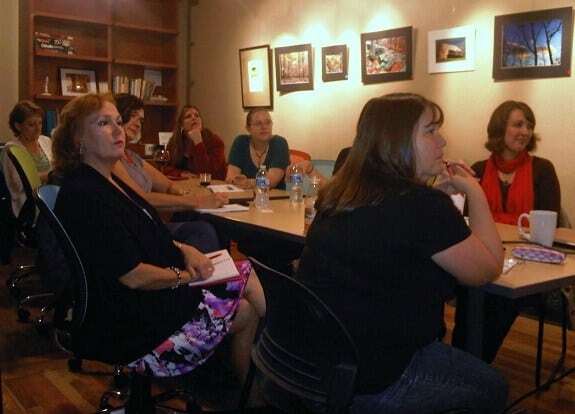 Community Cowork Frederick is people working side-by-side, sharing, learning, growing. Cowork Frederick is our members, not the building or logo. Our sense of community extends to Frederick and beyond. We actively support local creativity through programs like Artist of the Month and we buy local as much as we can. And, we work hard to be good "world citizens" (see Sustainability). Accessibility What's ours is yours. We’re not interested in closing doors and sectioning off space. Unless a room is reserved, you’re welcome to use it. We don't track pages printed or cups of coffee drunk. With few exceptions, if it’s in the building, you’re free to use it. As for ADA-compliant accessibility, while we remodeled our downstairs bathroom to make it accessible, unfortunately, we were not able to make the building itself wheelchair accessible. Sustainability We share space, resources, and ideas. When we remodeled, we used salvaged and eco-friendly products as much as possible. We buy organic and/or locally provided food for our break room. We are good stewards, reusing what we can, recycling, and purchasing “green” products.